i Click 'view all' to instantly compare this fantastic deal with offers on other top samsung tablets. 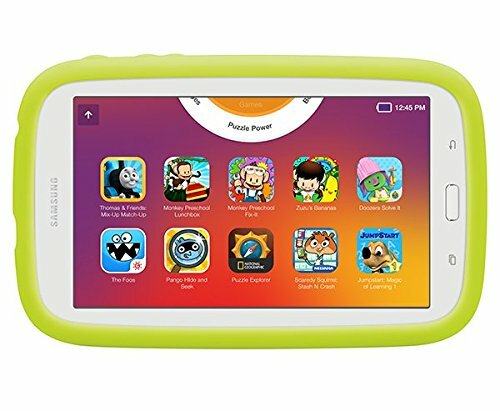 Samsung Galaxy Tab E Lite Kids 7 Inch 8 GB Wifi is currently selling at $99.99, approximately $25.73 lower than average, giving a potential saving of $30.00 right now. With a lowest price of $99.00 and an average of $125.72 it is selling on the low end of its usual range. Price volatility is 3.71% (meaning it changes a few times a week), so the price should stay low for a while. Right now this product is a recommended 'fantastic deal'. Compare the current price, savings (in dollars & percent) and Buy Ratings for the top Samsung Tablets that are closely related to Samsung Galaxy Tab E Lite Kids 7 Inch 8 GB Wifi. Here is how Samsung Galaxy Tab E Lite Kids 7 Inch 8 GB Wifi compares with other leading Samsung Tablets. Tablet FeaturesBring your kids the educational content you trust from DreamWorks Animation, Sesame Street, National Geographic and more.Your kids can explore a variety of engaging Samsung Kids content that aligns with STEM and Common Core curriculum.Set time and select app categories for your kids and monitor their progress on the dashboard.